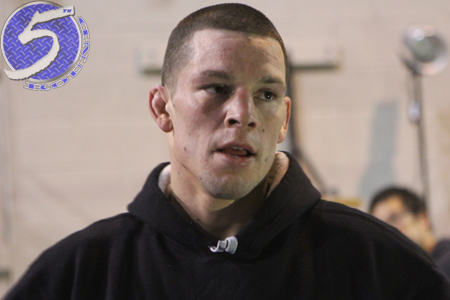 If Nate Diaz (pictured) has his way, he will soon join brother Nick as a former UFC fighter. On Wednesday, Nate requested his release from the planet’s premier mixed martial arts promotion. Some people give notice in person, others send an email. Old school folks submit a fax. Diaz, the tech-savvy guy he is, thumbed out his demand on Twitter. “@ufc @danawhite I would like to request to be released from the @ufc Its time for me to be on my way .. ?” Diaz wrote. The question mark Diaz used to end his sentence is peculiar. Is the former lightweight top contender asking if it’s time for him to be on his way or was that merely a typo and he meant to use a third period (…)? Who knows when it comes to the Diaz brothers (…)? Diaz’s post is likely a reaction to getting passed over to challenge lightweight champion Anthony Pettis for his belt. That gig was handed to Diaz’s homie, Gilbert Melendez, who will coach opposite Pettis on “The Ultimate Fighter 20” before meeting for the hardware. Diaz has been griping for a title shot since posting a TKO victory over Gray Maynard in November. However, UFC president Dana White refused to acknowledge the 28-year-old as the division’s top contender since it was only his first win in three outings. Diaz also wanted to renegotiate his UFC contract, an extension he inked three fights ago, after beating Maynard. Once again, White didn’t believe his current 1-2 run warranted a new deal. Diaz owns a 17-9 professional record, going 11-7 in the UFC after winning TUF 5 in June 2007.